If there is anything that is better than Dilli ki sardi, it has got to be Mumbai ki barish. This beautiful city just got more beautiful following the past few days of rains! Monsoons in Mumbai are magnificent! One of my favorite things to do when it is pouring outside is to sit in the balcony of my Juhu home with a cup of tea and listen to music and read a book. The pitter-patter of raindrops is absolutely synonymous to the sweet melody of Kishore Kumar’s voice. However, these luxurious days do not happen as often as I would like them to, thanks to a busy work schedule. I have had a ball of a time shooting for Master Chef India – season 3. 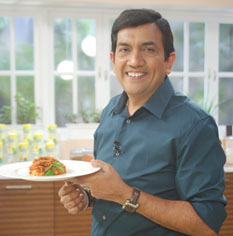 The passion and love for cooking that the contestants has inspired several other people to pick up their karchis and pans and step into their kitchens, while I step into the sets of my show on FoodFood – Sanjeev Kapoor’s Kitchen. Time flies during the shoot and the only time I realize how beautiful and rainy it is outside is post pack up! Also, I have been travelling for my Live Shows in Jodhpur which was yesterday and tomorrow will be in Ahmedabad for the same. Work doesn’t stop amidst the rains as well, that’s what the best part is about the Mumbai rains as well. The spirit of Mumbaikars never dies and they are on the go and moving, unless really stuck! This kind of weather also manages to work up quite an appetite. At the same time, we are also finicky about eating out during the monsoons. The best thing to do is to whip up something for yourself at home, sit by the window and enjoy the rains while basking in the glory of the dish that you have prepared. The dark skies and heavy clouds make us lazier than ever so you don’t want to make something that is too complicated or involves too much preparation. The good thing about this is that more often than not the simplest dishes are the best ones. I’m sharing with you 3 things that are sure to put you in the right monsoon spirit and satiate your hunger on days when it is pouring cats and dogs outside! Soups: Soups are a palpable choice for rainy days. A bowl of hot soup on a chilly rainy day is what bliss really is about. Besides the comforting factor, soups are also great for you because they are highly nutritious and easy to make. The best part about homemade soups is that you can alter the soup to your preference and taste. Whether you are making a Chinese soup, international stew or an Indian shorba, soups give you ample freedom to tweak the recipes. You can also use a number of side dishes like vegetable sticks, croutons, bread sticks and salads, etc. and make a complete meal out of it. One dish meals: When I think of rainy days and one dish meals, the dish that comes to my mind is laksa. Laksa is originally a Malaysian noodle and coconut milk based stew. The spice from the chilli paste and the sweetness from the coconut milk offer a perfect balance of flavours for a stormy monsoon day. While my favorite is a Prawn Laksa, a chicken or beancurd laksa is equally delicious. You can also make rice and vegetable casserole or my all time-all season favorite kadhi chawal. These are minimum effort-maximum satisfaction dishes which are all you need for monsoons. Pakoras: It will be unfair if I’m talking about monsoon treats and don’t mention pakoras or bhajiyas as they are called in some parts of the country. While deep-fried garma-garam onion and potato bhajiyas are classic, it is time to move on and explore more different types of pakoras, for example, something like chawal ke pakore which can be made using left over rice or a paneer sandwich pakora or even a pasta pakora. One thing that comes along with the joy of eating pakoras is the guilt for cheating on your diet. The solution to this is baking instead of deep-frying. Try baking pakoras, I assure you that they are as tasty as the deep-fried version and obviously a lot healthier. Have them with a hot cup of green tea with honey instead of masala chai with sugar and you can wave bye to all of the guilt associated with pakoras and chai. If you live in Mumbai or for that part in most parts of India, you will realize that you can either love the rains or hate the rains but there is no way you can ignore them. Luckily for me I have always been a fan of the rains and thoroughly enjoy every aspect of the monsoon, especially how beautiful and green it makes our surroundings. Combine some good food with this weather and you will for sure have a smile on your face. I would love to know about your favorite monsoon food and food stories. Tell me what you are cooking this monsoon. Keep cooking, keep eating and make the most of the rains while they last! It is a common practice in Ayurveda to eat food according to the kind of dosha or constitution of your body. Kapha types benefit from bitter and pungent food, people with a pitha dosha benefit from bitter, sweet and cooling foods and if your dosha is a vatha type then it is salty, sour and heating foods for you. Food is cooked without the use of oil and green chillies and other spices. The belief is that the food you eat can heal the imbalances in your body. This kind of cooking philosophy makes a very popular saying in India, “jaisa ann, waisa mann” hold true. You are what you eat. Your temperament and nature is more or less based on the kind of food that you consume. Have you ever thought about the reverse of this philosophy? Kehte hain ki swad toh khana banana waale ke haathon mein hota hain! Food is only as good as the amount of love and hard work that has been put into preparing it! Ever wondered why the kadhi chawal your mother makes is way better and much more comforting than the gourmet food at a high end restaurant. Why is it that the instant noodles you ate during your college days tasted better than the expensive Chinese food you eat at a five star today? Or why you relish a meal that your spouse, who normally cannot cook to save his life, has prepared as a surprise for you? The reason is simple. Cooking is a combination of art and science. Food prepared with love, conviction and interest along with proper cooking techniques will taste good. You cannot create a good dish if you are not in the correct frame of mind and just throw together a bunch of ingredients in a pan. Good food is not a product of expensive ingredients, complex cooking techniques, degrees and certificates. A good dish is a master piece that is created with a lot of love, interest, patience and of course haathon ka jaadu! Someone who takes great pain and uses perfect precision in their cooking process may not necessarily come up with a great dish unless they have the knack for cooking! The person cooking food should always have the right attitude. I firmly believe that the positivity translates into taste and spreads positive energy from the cook to the food and to the people eating it! To enjoy cooking you also need to have a pleasing kitchen. No one wants to cook in a haphazard, unorganized and messy kitchen! Imagine cooking in a beautiful kitchen with a clean worktop, proper utensils and fresh, interesting ingredients – it will be a breeze and will make you want to keep coming back to try out newer things everyday! Another big incentive in cooking is all the praises you get – works as positive reinforcement! It is pretty simple. Food and love are synonymous. You cook with love, serve with love, eat with love. There is a popular Spanish phrase which says “barriga llena, corazon content” which literally means “full stomach happy heart.” It is true that people tend to be a lot grumpier when they are hungry. When someone eats good food it instantly lifts up their mood. Don’t you think it is essential that the food which is going to make someone happy should also be prepared in a happy frame of mind? Don’t make cooking a compulsion. You shouldn’t be forced to cook, for you cannot put up a great dish if you don’t believe in it. Don’t be afraid of failure, you may not be an amazing cook from the first recipe you try, but if you like cooking, eventually you will come around. After all, Rome wasn’t built in a day! Keep smiling, keep cooking and keep eating!